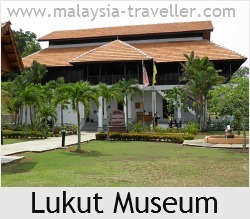 Lukut Museum, together with the neighbouring Fort Lukut (Kota Lukut), make up the Lukut Historical Complex. This fortress was the scene of violent struggles and intrigues to control the area's once lucrative tin industry. In the early 19th Century, the Sultan of Selangor ordered Raja Busu (also known as Tungku Bongsu) to take over the Lukut district where a tin mining was becoming established. Raja Busu did not treat his Chinese workforce well and in 1834, following the imposition of a new tax, the miners revolted and set fire to the palace resulting in the death of the Raja and his family. A new prince took over, Raja Jaafar ibni Almarhum Raja Ali, a bugis from Riau (Sumatra). 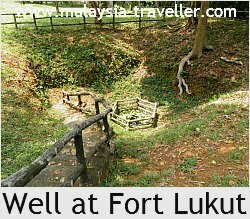 His son, Raja Jumaat, built Fort Lukut around 1847 on top of a hill called Bukit Gajah Mati (dead elephant hill). 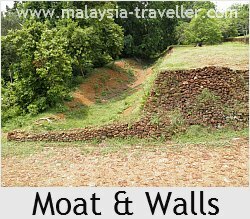 The fort was about 200m long and 170m wide surrounded by a 5m deep moat spiked with sharpened bamboo stakes to deter attackers. Within the walls of the fortress were palaces for the Raja and his daughter, Raja Wok. There was a court for playing sepak raga, a kind of 'keepie-uppie' played with a rattan ball which is still popular in Malaysia today. Water was provided by a well (reserved for the royals) and some cisterns which were replenished with water from a nearby river transported by bullock cart. 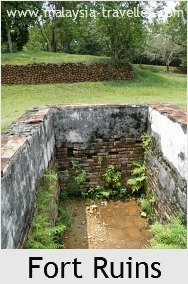 There was also a poisoned well used for executions. After Raja Jumaat came his son, Raja Bot, who employed 30 Arab mercenaries to bolster his defences against his enemies, chief of whom was Raja Sulaiman (another relative). All these defences however were not sufficient and in 1880, after continued infighting, palace intrigues and the depletion of the area's tin wealth, Raja Bot was obliged to relinquish his powers and the fort was abandoned and fell into disrepair. The Lukut district became part of Negeri Sembilan state in 1878. Today the fort has been cleared of jungle and the area is well maintained. Some of the walls, trenches, the well and building foundations remain visible. The museum is housed in a fine bungalow which was once the residence of the district officer. The museum contains artefacts unearthed during excavations at the fort including pottery shards, stoneware and tiles. There are also exhibits on local history, the tin mining industry and local customs and traditions. The grounds of the museum also contain some old bronze cannons which were recovered in 1995 during a survey of Bambek Shoal off Port Dickson. 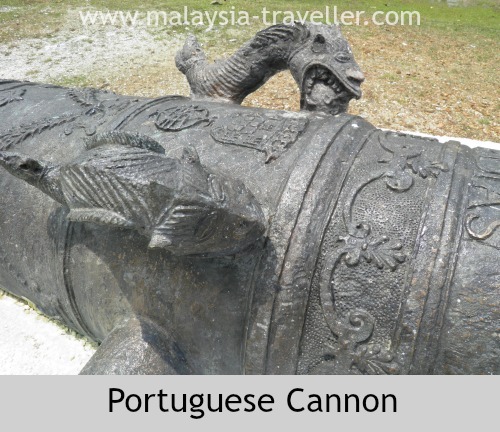 The cannon above is Portuguese, made in Goa, and belonged to one of two Portuguese ships which were sunk in the Battle of Cape Rachado in 1606 (two Dutch ships also went down). Open daily from 9am to 6pm, except on the first day of the Hari Raya holidays. 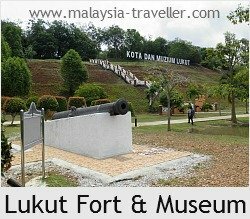 The museum is a few kilometres outside Port Dickson. The location is marked on the map on the Top Negeri Sembilan Attractions page.